CPL to exhibit zero emissions conversion at two of the Greenfleet shows. 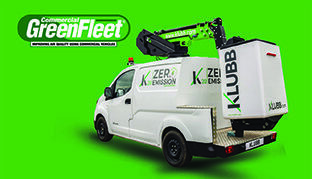 This year CPL have launched the Klubb K20 eNV200 Nissan Zero Emissions van mount in the UK. With an impressive 10m working height, 5m working outreach and no outriggers, this conversion is a perfect partner for anyone working within urban areas. The no outriggers design allows for a speedy start to any project and the compact size of the vehicle makes it very easy to manoeuvre through tight city streets. The fully electric, zero emissions van mount has been designed in keeping with the green strategy of the company. All the van mounted access platforms have the option of a green package. This allows the boom to be operated with the vehicle engine switched off.